Contoured back-up Rings are anti-extrusion devices, generally recommended when systemic pressure exceeds 1500 psi. The use of back-up rings can also extend the life of O-Rings in these high pressure operating environments. RT Dygert's contoured back-up rings are molded from a special high modulus, oil-resistant 90 durometer Nitrile (Buna-N) compound. 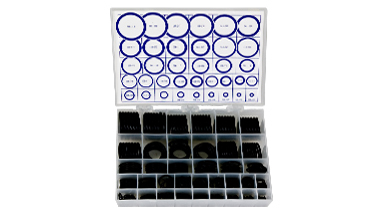 This 36-compartment kit contains 293 back-up rings in 36 different sizes. It includes a contents identification card with dimensions of each ring on one side and silhouettes on the other.